This year overwintered colonies seem to reaffirm conclusions that I have suspected for a long period of time. Not all bees are created equal! This is two colonies from feral stock Easter weekend 2013. 1005 (Left) is one from 2010 and 1208 (right) is one caught last summer at my next door neighbor’s. They saw it come from the woods south of their home. This video is from Easter weekend 2013. I am going to preface this post with the following declarations: 1) The number of records I am reviewing here are small. Therefore the power of my observations may not be great enough to classify them as anything. 2) I haven’t done any genetic testing on any of these bees, just caught them, hived them, and made records of how things have progressed over time. In agreement with the party line, keeping detailed records is very important. I have posted about this previously SEE Records Revisted Post 1 of ??. You never know what information will be valuable. I not only keep records on the progress of hives. It’s becoming more important to my operation to keep track of the source locations of the colonies that are trapped every year. 1205 Came from a place about 10 miles west of my house. I have not bought bees since 2010, favoring local ferals. Now that I have been trapping for several years I have made note of consistencies in both behavior and survivability of colonies trapped from different locations in my region. I liken these differences to something similar to a personality of the hives. For example one location provides consistently small swarms of noticeably smaller bees that tend to overwinter even if confined to only one hive deep. They haven’t proven themselves as heavy honey producers, but they survive year to year. 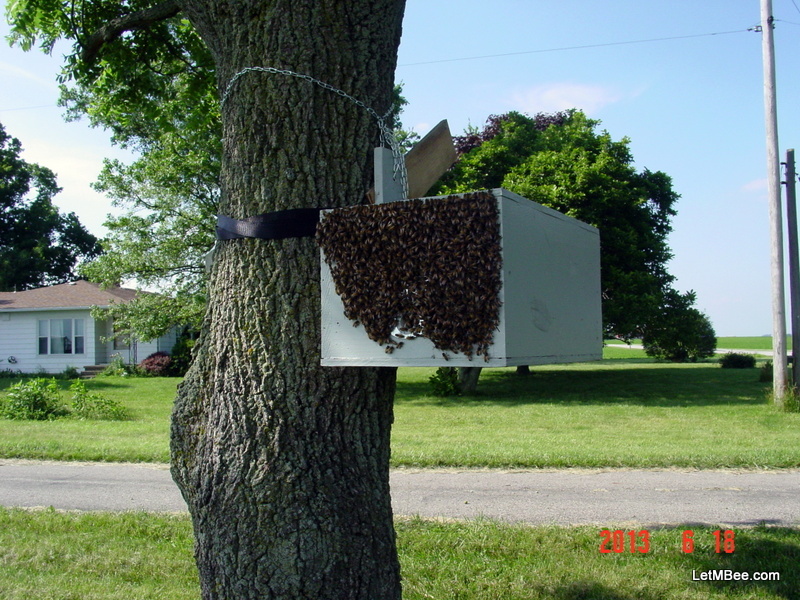 Another location produces very large swarms that have bees of many different phenotypes. They overwinter strong and begin working earnestly in the Spring, but their honey production also remains to be proven as they tend to prefer swarming to storing up supers full of honey. Sadly there are locations that consistently provide me with colonies that seem to be of little value to the operation. From those locations I source bees that have repeatedly been unable to cope, and fail to overwinter year after year. So guess what…. those locations didn’t get traps this year. A review of my records has led me to believe that some of these dud colonies are swarming from hives managed by other beekeepers. The longer I keep bees the more I discover locations of current managed hives as well as stories of apiaries from long ago. This information is helping me to determine the more valuable trapping locations. Given the time constraints this year I was forced to only trap in prime locations where proven survivors have been sourced. These locations tend to be in spots where there are NO managed hives. The genetics persisting without management are of more value to me than duds (welfare bees) that fail to overwinter. I value quality over quantity. Second swarm caught at my house last week. on 6/21/13. I have found 8 or 9 locations thus far that have provided me with hard working survivor colonies. One location in particular seems to be providing bees that overwinter well, build up steadily in the Spring, AND tend to provide surplus honey with regularity. This awesome location just happens to be where my house is located. I have known for some time that there are a lot of bee trees in this unlikely area. In fact I have found 2 new trees this Spring as well as a house in the area with bees living under the porch. It is unlikely that any bee would chose this spot for a home willingly since it is smack dab in the middle of mono-crop hell, BUT THEY ARE HERE!!! Just the fact that bees persist in this area where it is hard to make a living is a testament to their hardiness and work ethic. These colonies tend to build up strong the first year after being caught in a trap. They fill two deep boxes with drawn comb on foundationless frames. They typically overwinter strong and during their second year they have filled their third deep and make enough surplus honey to justify the hive equipment. A couple of downsides… They can be grumpy and will let you know when are taking too long on a hive inspection especially on windy days. Also if you place a one of these colonies in an apiary with a weak hive they will rob it to death during dearth conditions. So should I re-queen with inferior docile genetics….?? Convention and all of the bee journals say YES…….., but I THINK NOT! So…. Why are these bees here? There was a man that kept bees for 50-60 years that lived on the farm just East of me until sometime in the 80’s. After his death a neighbor bought his remaining 8 colonies and kept them for a while. Finally varroa took these managed hives and he hung it up. No one else had bees in the area until I installed 2 packages in 2010. Those ended up failing to overwinter and I seriously doubt that the high population in the area has anything to do with me getting into bees. I theorize that the lasting legacy of survivor bees in the area is a result of my long deceased neighbor. Over the years swarms must have made it out of his apiary and gained a foothold in what little suitable habitat they could find. They set up shop in trees among the patchworks of small woods that dot the otherwise barren farm ground and in uninterrupted drainage areas where trees remain. 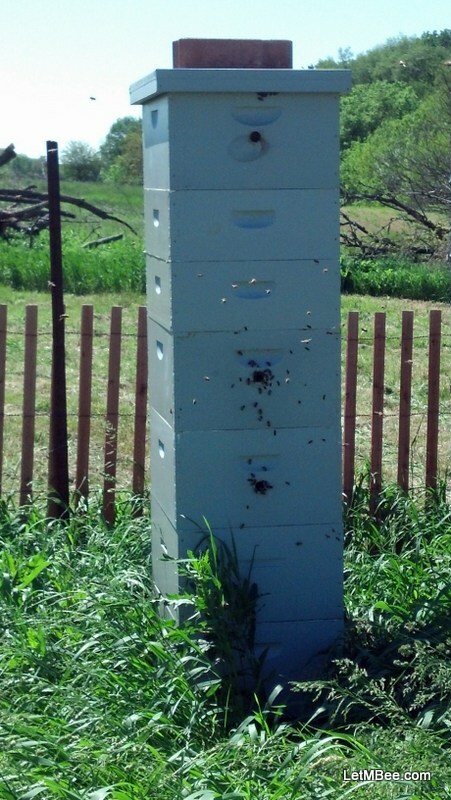 They somehow figured out a way to persist despite varroa taking out virtually all of the beekeepers around here. Genesis: 4/30/12 – Came from same site as 1005. Second swarm from the same place on the same day. This has given me further reason to OPPOSE SWARM SUPPRESSION. If you truly want survivor genetics you are shooting yourself in the foot when you go through destroying natural solutions to bee problems. Mother Nature will assist us in finding solutions…. And her genetic experimentation is FREE! Sure you may see it as an initial loss watching your honey and a viable colony fly away, but remember, WHEN those bees get established and are reproducing you will get free SURVIVOR genetics on subsequent years. So don’t view it as a total loss like every beekeeping instruction manual would have you believe. View it as an investment in your future and the future of Apis mellifera. Enough on that… I will devote an entire post on that sometime in the future. Back to records…. While pouring back through things several questions have been brewing in my mind. If I see this much variability in colony survival in my relatively small geographic location how well suited could a package of Wal-Mart Bees sourced from hundreds of miles away be for this particular location? We know that bees form different races when they exist in a location for long periods of time each being WELL suited to that geography. Would it not be expected that the different climatic regions of the United States would select for bees suited for those regions? How far away could bees realistically be transported and still be considered suited to the region they find themselves? How many other locations have a secret population of hardy bees that are persisting? Virtually everywhere I have placed traps I have caught bees. I know where other beekeepers have hives. Are bees out there doing their thing unnoticed? If there are locations harboring survivor bees are Wal-Mart Bee’s diluting the gene pool? Finally the heretical questions that is going to get me flaming comments and e-mails……. Is the current media campaign about CCD and bees “dying off” legitimate? OR is it just that, a campaign to focus attention and subsidies on a failing model of agriculture and apiculture to a public that is astonishingly ignorant about the natural world? Is CCD something pathological or is it a syndrome that has resulted from shipping bees around the country feeding them high fructose corn syrup expecting them to act as machines instead of living creatures? Is there a genetic component? Is CCD a bee problem or is it a problem of beekeepers in the current model? Genesis: TRAP12 From home back in back Maple tree ~7/25/11. I don’t claim to know the answers to any of these questions, but they are the questions that I ponder when I should be sleeping at night. Eventually we all will find out. It would not be the first time in human history that humans have fingered bogus causes for things we didn’t understand. One thing must be acknowledged first and that is there is a good chance that humans have played a part in bee declines. Finding out the cause of CCD will only take us so far. Time will tell if we have the stomachs to remedy what is determined to be the ultimate cause or causes. In my area I believe the two primary obstacles to bees are herbicides and habitat destruction. Herbicides kill the flowering weeds that bees need for sustenance AND DETOXIFICATION due to the rest of the crap we introduce into the environment. It is very fashionable to blame neonicotinoids for bee losses and CCD. Where are neonicotinoids on my list? My best trapping location is neonic heaven! Yet I have a thriving feral bee population here…. P.S. – I caught 5 swarms last week in traps, two of which came from neonicotinioid heaven and I have no established colonies here this year. 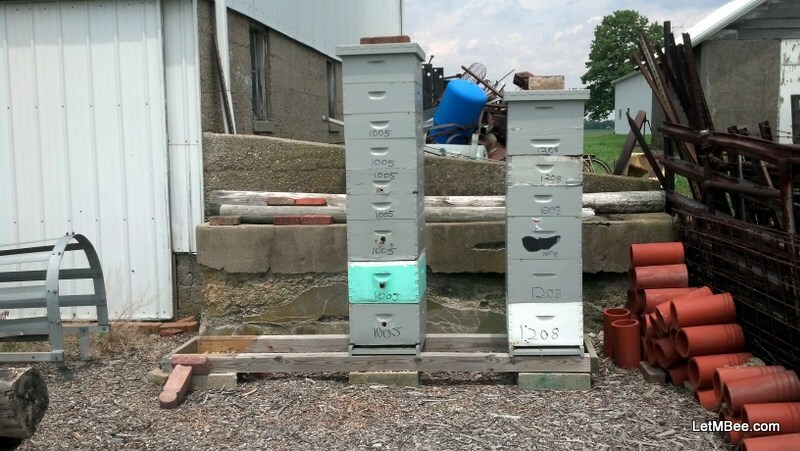 This entry was posted in Feral Bees, Hive Reports, Rants, Swarm Trapping and tagged bait hive, bee, bee genetics, beekeeping, feral bees, feral hives, Indiana Beekeeping, Jason Bruns, swarm trap, swarm trapping, treatment free beekeeping. Bookmark the permalink. From an informal survey conducted at one of our Portland Oregon bee club meetings it was discovered that nearly all of the hives that died over winter came from packages shipped from California. The winters here are nothing like anything in California, so it’s no wonder. More and more beeks here are discovering that swarm catching is the way to go. And there are plenty available. I populated 5 hives (4 of mine and 1 to a non-profit farm) with swarms, plus 4 more of mine from cutouts, and I’m just the tip of the iceberg. Others around here have reported catching 30+ swarms, but they work bees full-time, not just a hobby. And based on all the calls I’ve been getting someone could easily make a part-time seasonal job out of just doing cutouts around here. We seem to have a plentiful source of feral stock. 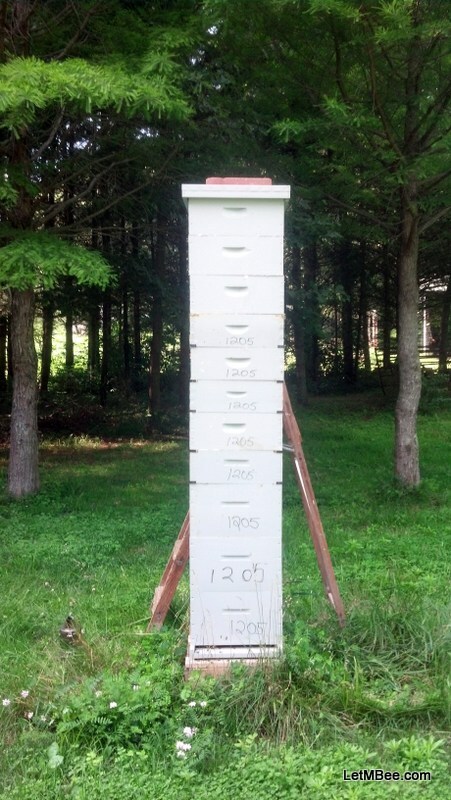 The farm I mentioned had lost all but 1 hive over winter…bees purchased from California packages. This year I’m part of a group of volunteers that is managing their hives and we’ve repopulated all of their hives (10) from swarms. So by next spring I’ll have some more first-hand data on how well the swarms have done over winter. Exactly. I can sit here and think of probably 30 ways we have altered the natural way bees live. Yet we expect them to not only live but thrive. I think we’re finding that breaking point which we’ve caused and simply playing the blame it on something else game. I think people need to get back to observation and leave their bees alone. You’re right (imo) on so many points here, Jason. I quickly learned from my mentors in my group that local bees are the best bees, not only because they are free, but because they are adapted… arguably, they also know where all the forage around them is too. I’m a big believer is balancing the number of hives in a location with the amount of forage that you *suspect* is in the area. It took me multiple seasons to find the right number of hives to put in a single radius, and made me seek out other outyards. This is not even considering the other hives owned by others that I may not be aware of. But seeing a good busting colony bringing in weak amounts of nectar is both frustrating, and sad. We call our bees Indiana Mutts around here. As for pesticides, of course this plays a role in the decline of bees, but to what extent will be argued probably longer than we’ll be around (I hope I’m wrong). As you know Tim Ives has great success in hives sitting right on neonic heaven. And, Randy Oliver, one who I follow intensely, has done much research on this matter. I could go on and on, but those interested can check out the “Real World Beekeeping in the Corn Belt” blog in my website. As backyard beekeepers, all we can do is keep on keeping… that is, both beekeeping, and log-keeping. This is important, as you know. Look at all the information that you have to suggests local bees are better than imported packages. You know where they came from, and what they have been doing. When a hive suffers, and you know nothing of its history, then what have you gained? Many will move on and throw up another hive only to repeat the failure. Those who pay attention, and keep logs to create a basis will eventually arrive at a place that tells them, how many hives to have in one spot, about when the honey-flow starts, about how much to expect, and more. Of course there will be deviations, but you’re armed with more knowledge than none. I especially use my basis of information to help me understand things more when there are problems. It took me three years to see a hive beetle in my hives. When I did, I knew they would only get worse, and they have. So, I have a multi-pronged approach to dealing with them. Some in my club (20 miles up the road from me) still haven’t had them, but know they are coming. I’m doing an experiment this season myself. The farm I’m keeping bees on told me they will be using neonics and spraying etc… The experiment is just in cooperation between the farmer and the beekeeper. I just asked him to keep me apprised of what he has to do. I didn’t ask him to change any of his practices, but only to give me a heads up on what he has to do and when. I plan to lock the bees up before and after the treatments (what else can you do), and keep logs during the process. Will report back on this one day. Great post. This year I have only seen one beetle. It was in one of my traps. I caught that group North of Fountain City, IN. I have NEVER had hive beetles up there before. I am not doing anything for them, just letting the bees handle it. for now. Almost everyone uses neonics around here now. They aren’t going away. I agree with Randy Oliver and Tim Ives. There are a lot of things beekeepers could do besides blame others for why their colonies fail…..
Oh Jason I wish you were closer! I got two packages this year – one doing well the other just petered out. I’ve accepted some critiquing that had I micromanaged (my term) that hive better I could have requeened thereby maintaining the hive. When I did get in there and investigate it was a bit late in the game and I couldn’t run right out and grab a queen. I did get my trap out early this year in a spot that has seen swarms in the past but so far no luck. My answer to my critics (well meaning all) is that I don’t want to micromanage hives! Am I wrong? I feel chastised on the record keeping though- I have to admit I’m a rather abstract/random sort of personality and while it works great for some things it makes other activities a chore! I plan to do better in the future . . . I think . . . well I might. I think you’re on to something for sure as I have often thought that it is no surprise that hives that have become so artificial don’t always succeed. I believe a problem is rarely the result of ONE cause rather it is a combination of factors that influence outcomes . . . like global warming hysteria for instance. As if the entire planet could succumb in a measly 100 years – less even- of manmade activities. I hope more beekeepers start to think outside of the box (LOL! literally) like you have. Now I just have to get out there and find some old deep boxes that I can convert into swarm traps! Next year I just have to have 4-5 traps out- I can’t afford these packages every year for one thing and I want self sufficient bees! I did talk to someone nearby who said their grandfather kept bees on their strawberry farm years back and I hope to have a swarm trap or two there next spring. I don’t know if you are wrong, but I agree with you. I don’t have time for that and all the rest of the stuff I do. I don’t want “tea-cup” bees. As far as records do what works best for you. My record keeping might not be enough for someone else, but I keep track of the things that matter to me. The longer you keep bees the more you will take note of as it is important to you…. At least you have a plan. With one trap it can be hard to get results. 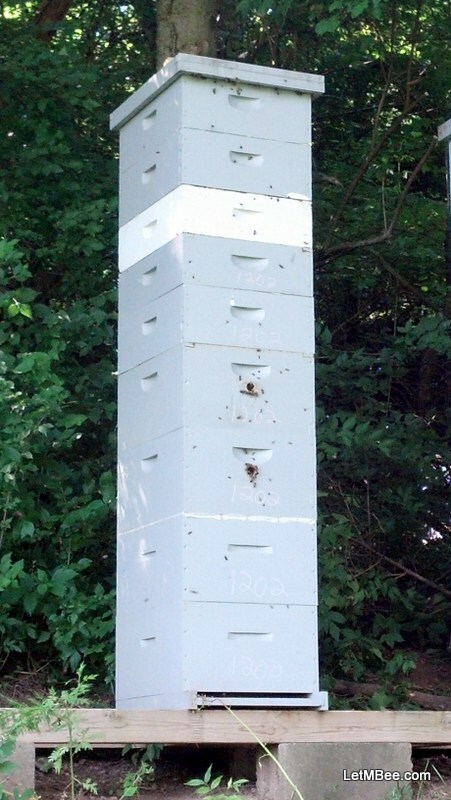 This year I have had locations that produced well in past years not catch a single swarm…. If you have 4 or 5, look for leads for next year and get those things out there. You will be in the bees. I have 4 traps here in my yard this year since I moved all my hives away from here. There are two locations that have each caugth 2 swarms…., but those other 2 traps just keep setting there. Why don’t they pick them…. HECK IF I KNOW! Just keep at it. You will catch bees. Hmm…I tried leaving a comment last week but it seems to have been eaten. Is the comment system working right now? Each year the feral gene pool is further diluted by the local sale of out-of-state bees. Sadly, many are even organized, sold and distributed by the “local” beekeeping groups, the folks who should know better. Why someone thinks bees from California are a good choice for Indiana beekeepers is beyond me! My hypothesis is that those bees have figured out a way to survive in that tree. If you catch a swarm from said tree and keep them 5-10 miles away in your apiary, chances are they will survive. That is not a groundbreaking idea…. Why aren’t more people doing it? How far do you think we can realistically move bees and expect them to be able to cope with their region? This year our bee group took an informal poll and it seems that the great majority of the hives that died over winter in our area (Portland, Oregon) were from packages shipped from California. That includes the hive I had that died over winter. We have plenty of swarms available around here so purchasing packages just isn’t a necessity. There are many bee groups in our area, but the one I chose to join and participate in (Portland Urban Beekeepers) has greater support and encouragement when it comes to natural, treatment-free beekeeping practices, and sourcing bees from local genetics. This year I have filled out all my hives with both swarms and cutouts…and I’m still catching swarms. I have no where to put them so I’m giving them away to others in the group. I like your thoughts on CCD, as I’m often pondering the same things. I do think CCD is a symptom of our current model. I try not to blame the beekeepers. I also don’t put all the blame on the agricultural companies. The problem is in the lack of communication between the 2. “Big Ag” doesn’t think about the pollinator because they think they can just order up some boxes o’ bees and have them whenever they want them. The beeks don’t want to bite the hand that feeds them so they nod their heads, make their deals, and do the best they can. I think that if all the beeks got together just one February and boycotted the almond population it would send a very loud message, and probably even decrease the bee losses that year. You are on the right track man. Tell you what. If you have taken plenty of swarm calls, try to find some old deeps to make traps this winter. Put one at or near each of the swarm call and cut-out locations. Next year instead of having to hive swarms on short notice before they leave you will be able to just go pick up the trap 4 or 5 days after it is occupied (when pollen is entering). It has made my schedule more manageable and my wife WAAAY happier. You know there are swarmy bees in those locations so capitalize. Especially if you don’t know of any beekeepers in those areas. After getting them home, hive them in the top box of either 2 or 3 deeps (allowing them to build DOWN), depending on the numbers. Don’t open them until the following Spring unless you think they have died. Currently with the way that I have been managing my hives I am spending less time successfully managing 30 hives than I did with 5 in 2010. I told my wife back then that there was no way I could keep bees if I had to get in them once a week. It is too much of a time commitment of not enough return and I think it is too disruptive. I told her that I was going to LetMBee and see what happened. We think we know what a brood pattern should look like, but what if a hive is showing signs of hygiene by removing diseased larvae and the beekeeper comes along and kills the queen because the brood pattern doesn’t look “good enough” upon inspection. There is no telling how many long term solutions to things such as SHB, varroa and other mites and maladies have been snuffed out by beekeepers thinking they were doing the right thing, by pinching off the head of an awesome queen in exchange for unproven genetics provided by a queen breeder. Nature finds novel approaches to problems and I dare say some of the approaches don’t make sense to our line of logic, but a solution is a solution. Do people buying queens research the records of stock purchased from such breeders? What does the beekeeper know about that queen other than she looks like a queen? When I catch a swarm in a trap I know at least one thing. The colony did well enough HERE last winter to send out a swarm. They can survive here. That queen wasn’t raised through manipulation by a human hundreds maybe thousands of miles away. That queen was raised by bees that overwintered in this climate facing all of the unique challenges that this region can dish out. In beekeeping that is the only thing close to a guarantee you can count on. BTW Kelley Bees has free shipping this month for a limited time. I did see some small print that restricted the shipping zones. I love their foundationless frames. They are all I use anymore in my brood boxes. I saw your video and you said shipping was a problem for you. Good luck man. I’ve been keeping track of all the swarms I’ve been catching on google earth so that I can put up swarm traps next year. One of the swarms I caught this year was with a trap. I saw that free shipping promo, but I’m in a zone that would only get 10% off. So I’ve been building my own boxes instead. Also the foundationless Kelley frames are available through a local shop now. Boxes I can see building I made 30 some deeps the year before last out of ash. It was a huge savings for me. Currently I really like Kelley’s foundationless DEEP frames. I haven’t made frames yet, but am aware that they are time consuming. Just thought I would pass it along to you…. Yea they are mostly for assembly though you also need some nice wood working tools if your going to make joinery type frames, the ones I make are nailed but join type frames, defiantly flimsier then store sourced ones but I still have not had a joint fail. Very informative, I’m learning quite a bit from your blog. I especially liked this line “View it as an investment in your future and the future of Apis mellifera” I hadn’t thought of it that way and it makes a lot of sence. This is very interesting, I firmly believe that the biggest reason most folks loose bees is simply bad genetics, breeders treat their bees for diseases, plus non-local breeders are just not local enough for their bees to be adapted to our pressures. So when someone tells me they loose 50% of their colonies every year it makes me wonder if the normal adaptation is stunted/halted simply because they always buy queens from xyz. I know of my three californian queens only two went on to survive the winter and only one of their daughters survived this last winter. Keeping bees without treatment means your gona loose bees but if you keep picking the strongest hives eventually your losses will go down. Holy cow Sam…. Your comment reads almost word for word some of the reasons that I think many have trouble with bees. It is something that Tim Ives has commented on in some messages. He has refered to purchased bees from far off as “Junk @$$ Bees” speaking of their genetics. Since I began capturing bees from around here yeah… I have lost some of them, but that is Animal Husbandry, from time to time you will lose animals. This is especially true when you are a novice. The good ones survive, the duds, provide empty houses for subsequent swarms. I found your writings very interesting. I too have thought for a very long time about this subject and conducted my own experiments. I DO believe swarming is essential to genetic diversity due to natural selection, however I intend to make a broader point that I think you will appreciate. Swarming typically won’t work well for the backyard or urban beekeepers, because bees end up in homes and sheds. Living in the rural wooded areas, however does support this idea rather promisingly. I would like to add my 2 cents about “Neonics”, because I feel it is extremely important for all of us to pay attention. This pesticide may also be harmful to humans and animals as the evidence is suggesting. Bees that are anecdotally adapted to a so-called “neonicotinioid heaven” does not alleviate the problem of residual toxicity THAT DOES EXIST in the food product within the hive, nor does it fix the residual effects within a local ecosystem that supports human food. I also find it interesting that we as a group are willing to pay for the after-effects of our manipulations (ie, birth defects, medical treatments, possible gmo effects), rather than paying more for healthy food that is harder to grow. Either way we will pay for it. Somehow I don’t think we could make conclusions about how bees could become better survivors by letting them take their own course, and end up not noticing that we were the problem in the first place. I assure you nowhere did I state that neonics are good for bees or humans. They are toxic substances that poison more things in our biome than either of us has any ability to appreciate. The main message that I am trying to get out to beekeepers is that bees are able to find solutions for the obsticals all of them are facing all over this world. Many of the mechanims that they use naturally are being foiled by current beekeeping “Standards of Practice”. Evidence that stock raised in these areas are able to cope with neonics is evidence that CCD isn’t caused by these chemicals. If we are looking at a problem’s fales boogeyman we aren’t focusing what is important. The only way that these chemicals will stop being used on the food system is if the consumer demands it. Until that point the cold hard fact is that these chemicals are being used. IT does me no good to fret and shout and scream about the way things are, I must seek solutions for success despite the obstacles just as Apis mellifera is forced to do. If bees have a way to live with neo-nics in my area it is a very important survival strategy for my bees and my business. The only way to change this is educations. The American consumer needs to put a higher value on the quality of what they eat, but I cannot make them. Believe me I am perfectly aware of this problem. In nature bees have never had any ability to affect the world around them enough to change anything. They have have evolved in a world that has constantly been changing, heating up, then cooling down, then heating up again. They have no control over the world now either, but the same adaptability that has seen them thus far will see them into the future. In all probability humans will be gone before bees are wiped out. I understand the value of producing a large percentage of my families food. It costs a lot more than one imagine. If people want better food selection they are going to have to pay for it. It would be great if everything were already ideal….. It is one thing to point out what it is… I assure you I am working toward ideals. There was a time when I pondered why everyone else wasn’t doing anything. I know the only way I can make a difference is to do my part. The biggest difference I think I can make is to make people aware that feral bees are out there. They are living and if we give them habitat we are doing good for them and us. Their valuable genetics will be perpetuated. There is no need to support the package bee business, which is just as bad for bees as the food system is for humans. The next step is to educate those around us to make better bee and food decisions. The only way the current paradigm goes away is if people defund it. I’m just trying to make it in the world the way that it is, just like my bees. I don’t think we get anywhere pointing out all of the problems, while failing to focus on solutions developing around us. I mean really are we on different sides of this issue? Hello Jason and contributors to WHERE YOUR BEES COME FROM MATTERS. I’m learning to pay attention to this vein of thought the hard way, losing package bees and queens that come from…..
Do have a hive of local survivors that came from a huge cottonwood that blew down in a forest here in central KY. Those bees are doing fine. Also have small black bees that a friend got in a cut out. Gonna set out my swarm traps. Caught a swarm in March 2014 in a research forest where I am a volunteer beekeeper. Those bees are doing fine too. So thanks to you Jason and contributors. Your contributions are helping readers learn about feral stock, package bee industry being unsustainable, neonics info. and ways to help us help the bees. You are sure welcome Mac. Good luck in your trapping. If you have any questions drop me a line. Also if you happen to make any observations that could help me out pass those along too. Once you start trapping bees you will find it to be one of the most enjoyable times of your beekeeping year. When I get a call about HIT I still get as excited as the first time it happened. I’m so glad I read this post today. I was a couple days away from ordering some packages because I’m so hyped up about starting back up beekeeping for 2016. But hell with that now. I put my name on every swarm list I could find and made a nifty little web page. There’s no way I’m not gonna get bees with all the traps I’m putting out. I’ll save the money for lottery tickets. In one of these comments you mentioned to the poster “Bill” on July 1, 2013, you told him to put the bees in the top of the hive and let them build down. Can you explain why you suggested this to him, what benefits he will see and anything else you may have to add. I have never heard of them building down and am wondering what this method will produce. In a natural cavity bees will hang comb at the top and begin building down. This is what nature has designed them to do. I advocate managing the brood nest similar to the Warre method. 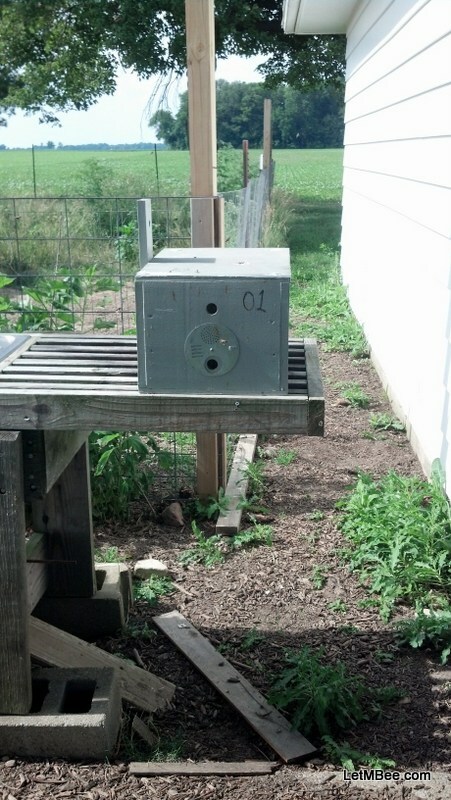 New brood boxes are put UNDER occupied boxes in order to mimic nature. New boxes on TOP is just done for ease of the beekeeper AND it requires use of foundation to pull it off. I do not use foundation. Bees build on foundationless frames almost perfectly if they are allowed to work down. This removes the cell size debate that gets so heated in the beekeeping world because they make the cells whatever size they want to. I have many pictures of them hitting traps on the ground, on tables, and on hive stands. I’ve read all the stuff that say a they need to be 10-15 feet in the air. It’s not worth the risk. They are looking for a cavity. I’ve found several feral colonies in the hollow bases of trees belly button level or lower. If it’s safer to keep them on the ground….. put them there. Great article. I ask getting back into beekeeping after a 30 yr hiatus. I remember my father building unwell over a thousand hives and never bought bees. He would occasionally buy queens to mix the stock a little. Everything bee had was from splits and swarm’s. We never had the die off i read about now. Occasionally a yard would be hit hard usually from pesticide’s. We even hauled to the Texas plains for pollination services. I wonder if the easy route of buying bees is weakning the species. Any time it seems that we take the easy route complications arise. I liken buying bees in packages feeding poor performing colonies or any chemical treatments to common childhood stories. It seems they are filled with little ogres or some other malevalent character promising a simple fix to make all of the problems go away. Inevitably the simple fix always ends up bringing unintended consequences and the moral of the story ends up being that things would have been better through a course of WORK and DETERMINATION instead of a quick fix or trick. I have never purchased a queen, but see amazing variation in both phenotypic (visually observable) features as well as differences in behavior among the bees I capture in my many spots here in Eastern-Indiana. My method for introducing variability in my genetics has been to strategically mix the colonies I place at the different outyards from different sourcing locations. There are feral bees here pretty much anyplace that suitable cavities can be found. I provide extra room to my colonies early in the Spring, but allow them to swarm if they feel the need. The matings tend to go well in the established colonies provided they aren’t broken apart during times when drones can be seen returning to established colonies in the afternoons. I haven’t been actively posting recently because I’ve been busy working bees, taking pictures, and shotting video of activity. This winter I have a huge backlog of drafts that I will be discussing. In the meantime check out the plans for traps on this site and attempting to get some bait combs from an established beekeeping friend. Also check out my YouTube channel as well as the LetMBee Facebook page.